I recently visited Washington DC and I took my family to the Smithsonian’s Art Galleries. I love art and I enjoy looking at art. When we left the Museum of Modern Art, my family also left more impressed with the art that is sent into our contests. From the tens of thousands of students who participate in our art contest, we have all kinds of art sent in. From modern abstract pieces to beautiful portraits. It is our job to trim the entries down to what we feel are the top 25%. It is not an easy task. However, having seen a large painting in the Modern Art Gallery where I wasn’t sure if a 20 foot by 20 foot plain orange canvas with a black line slashed across the middle had been vandalized or if it was put there on purpose, or looking at a canvas with what looked like a representation of a dry erase board that had math formulas partly erased, I also realized that once you are established as an artist you have credibility and anything goes. I know if we had accepted similar art and published it in our books, I would have received letters from teachers and students asking me to justify printing bad art when other students had entered better pieces that were not accepted. 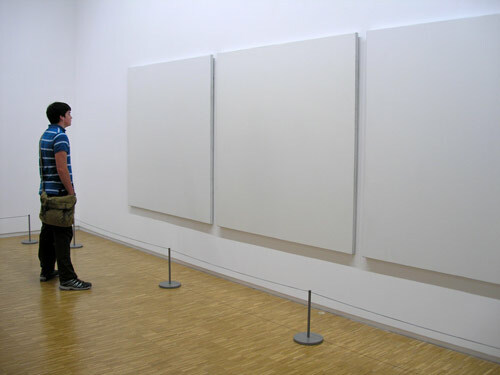 I know art is subjective. Modern art is supposed to push things to the edge, but seeing much of what is displayed, it makes me appreciate every piece that is sent to us. Don’t get me wrong, I love modern art, but I also like to see art where I can feel the talent and struggle behind the art. Our books are a presentation of what our judges feel is good art. Not everyone will agree with our decisions. But we hope people will see the merit in what we chose for the publication. For more information about our national art contests, please visit www.CelebratingArt.com. The deadlines have now passed for entry into our spring contests. It is always a joy to come across a teacher who really knows how to teach and you have 30 entries that are each a joy to judge. It always comes down to the teacher. We have some teachers who send in 50 entries and none are accepted. In other cases, a teacher who really works with his or her students sends in 50 entries and all 50 are accepted. There are several teachers who I wish were teaching my children. I really don’t think these exceptional pieces of art or poetry came from schools with above average students. Many of them come from normal neighborhood public schools. I think a teacher took ordinary students and taught them techniques that ended in extraordinary results. I hope as teachers see our books and realize what each grade is capable of creating, the bar can be raised. I hope next year, one teacher will look at our contest with the attitude of “Wow! I didn’t know kids could do this quality of work,” and then that teacher will take it as a challenge next year. My hope is that for his or her class the expectations that the students and the teacher have will be raised and another class will produce extraordinary work. For more information about our national writing contests, please visit www.PoeticPower.com. For more information about our national art contest, please visit www.CelebratingArt.com. My son, who is in 8th grade, was in The Merchant of Venice this weekend. Locally, we have a theater group for students in grades 4-12 that does three full-length Shakespeare plays a year. The director could do simpler productions, but instead she stretches these young minds and expands their vocabulary and understanding of the world. As teachers, it is comfortable to not stretch our students. I know teachers that give a simpler assignment because they feel too much of a challenge would be too difficult. But having read student poetry and reviewed student art for our contests, I see the students who have been stretched and it is amazing to watch the growth. When you have one excellent artist or writer in a classroom, then it is the child. When you have an entire class of great writers and artists, it is the teacher. We have our essay writing contest coming up Feb 15, and our poetry and art contests the first week in April. Just as my son can use the word “peevish” and understand the concept of the risk of loaning money as understood in The Merchant of Venice, I know that stretching him brought a great return. Expect great things and great things happen. Don’t Limit Yourself — You’ve Got What You Need! Last night my daughter, who is in a wheelchair, tried out for the musical Narnia. We have always taught her that the greatest limitation we have are those that we put upon ourselves. Will she ever be a dancer? No. Then again as a 52 year old, non dancer type, I may never be a dancer either. There are many things she will never be able to do. So she focuses on the things she can do. These are the things that are the successes in life for her. She may not get a part, but there is a 100% chance she would NOT get a part if she didn’t audition. Her list of awards in art, writing, science and history at the school, regional and state level are impressive for a 6th grader. She has not let her handicap hold her back. Two arms, two hands, two legs, two eyes. And a brain to use, if you be wise. So start from the top, and say, “I can”. Look them over, the wise and the great. They take their food from a common plate. And similar knives and forks they use. You can triumph and come to skill. And the man who has risen great deeds to do. God has equipped you for life. But he lets you decide what you want to be. So figure it out yourself, my lad. You were born with all the great have had. Get hold of yourself and say “I CAN”! As humans, we all have the same gifts or equipment. However, beyond basic equipment, we have to take advantage of the opportunities that are given us. We can’t sit around and think about things, we must Do. We must say “I Can.” Each of us started out the same as all the great ones of the world. George Washington had two eyes, two feet and a brain. Same with Abraham Lincoln, Martin Luther King, and every great person the world has known. What made them great is what they DID. What we do with the opportunity given to us is our choice. That doesn’t mean just saying “I’m going to do something”, it’s actually doing it. I pass this message on to all my students when they are afraid to try something new. Don’t limit themselves. For my daughter, she could sit in her wheelchair and think of all the reasons she can’t do some things. Instead, she thinks of the things she can do. It was risky and scary to try out for a musical when you can’t dance. But she did not limit herself. By the way, she got a part.